Guitarist Adrian Belew, bassist Tony Levin and drummer Pat Mastelotto bring their Three Of A Perfect Pair Music Camp back to Full Moon Resort in Big Indian, NY for its third year in 2014. The weeklong getaway – running from Monday, August 11 through Friday, August 15 – will feature performances, workshops, social and recreational activities, all set against the idyllic backdrop of the Catskill Mountains. The camp is part of the successful Music Masters Camp Series (www.musicmasterscamp.com) held at Full Moon Resort. Together in past incarnations of KING CRIMSON -- as well as the current CRIMSON PROJEKCT -- and separately through countless other bands, projects and collaborations, Belew, Levin and Mastelotto have helped forge the history of modern rock music over careers spanning five decades. 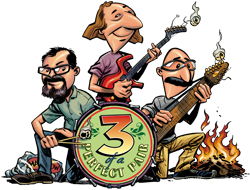 At the Three Of A Perfect Pair Music Camp, Adrian, Tony and Pat will share meals, tales from the road, and maybe even the stage during after-hours jam sessions with campers. Whether campers play guitar, drums, bass -- or no instrument at all -- Three Of A Perfect Pair offers a rare opportunity to learn, to play, to make new friends, and to get up close and personal with this trio of renowned musicians. Attendees at Three Of A Perfect Pair will have access to all workshops, seminars, gourmet meals, performances, and camp activities. Three Of A Perfect Pair Music Camp offers a variety of pricing options, based on the variety of available accommodations. All activities will be held at Full Moon Resort in Big Indian, NY, which features an eclectic array of comfortable, rustic country-inn accommodations as well as primitive tent camping. All accommodations are just steps away from daily camp activities. Guests can enjoy the spring-fed swimming pool, on-site access to the Esopus Creek, and explore the splendors of the Catskills on the nearby network of hiking trails. Dedicated to the celebration of nature, music and the arts, this one hundred-acre wonderland of mountains, fields, and streams is a world of its own. Prior to coming together for the Three Of A Perfect Pair Music Camp, Adrian Belew, Tony Levin and Pat Mastelotto hit the road in March 2014 for a month-long European CRIMSON PROJEKCT tour.